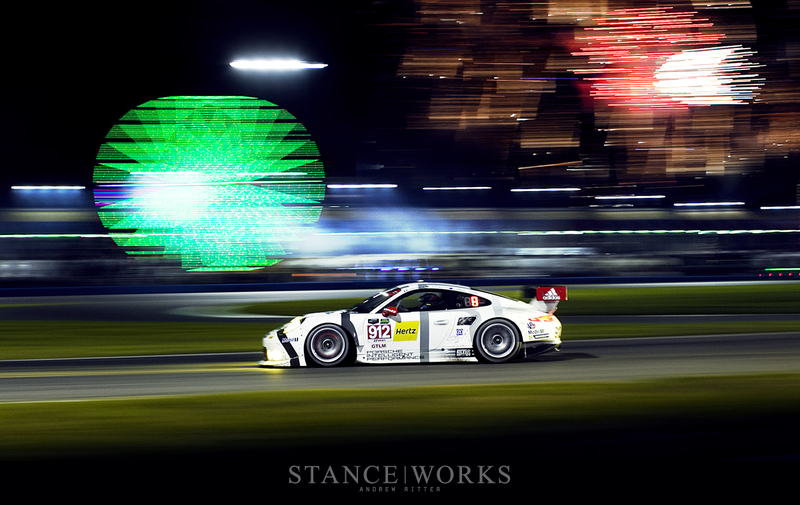 The 2015 season of the Tudor United Sportscar Championship has officially begun, marked by each season's inaugural race: the Rolex 24 Hours of Daytona. As a test of endurance for both man and machine, the Rolex 24 begins the season by filtering the weak and feeble from those that persevere. 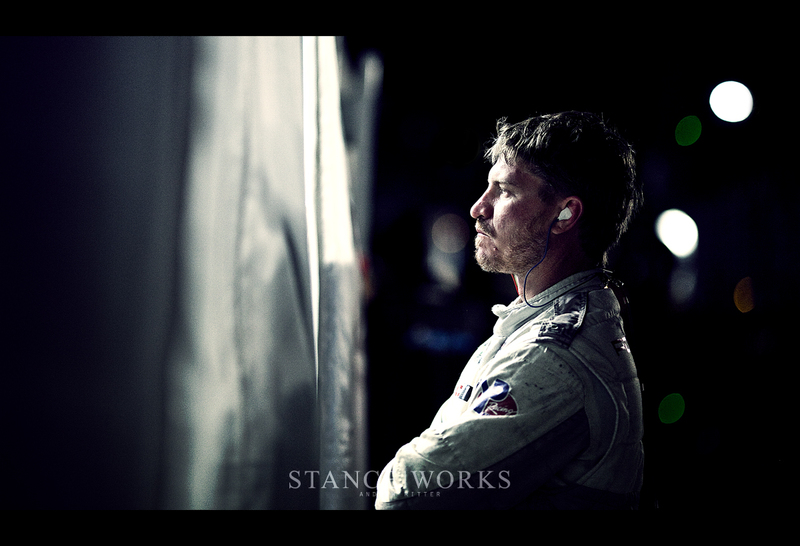 Those that make it to the race's end have withstood nearly every challenge motor racing can deliver. 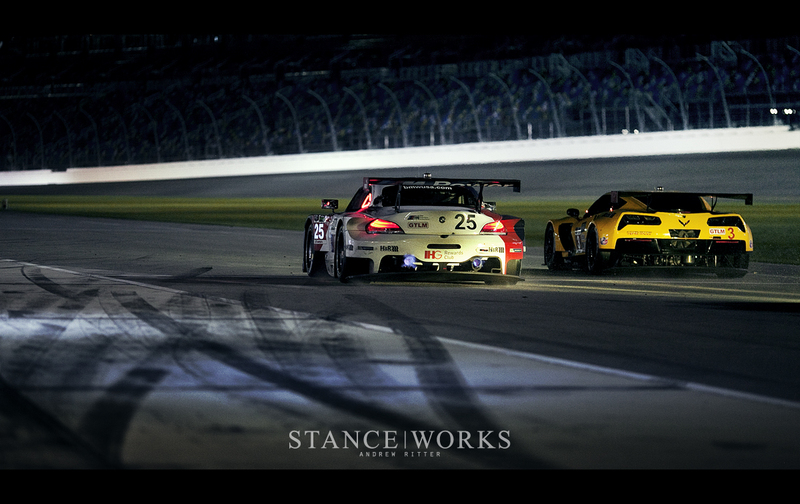 From pushing stamina and will, to talent, design, and strategy, endurance racing asks for all and gives little in return to its combatants. 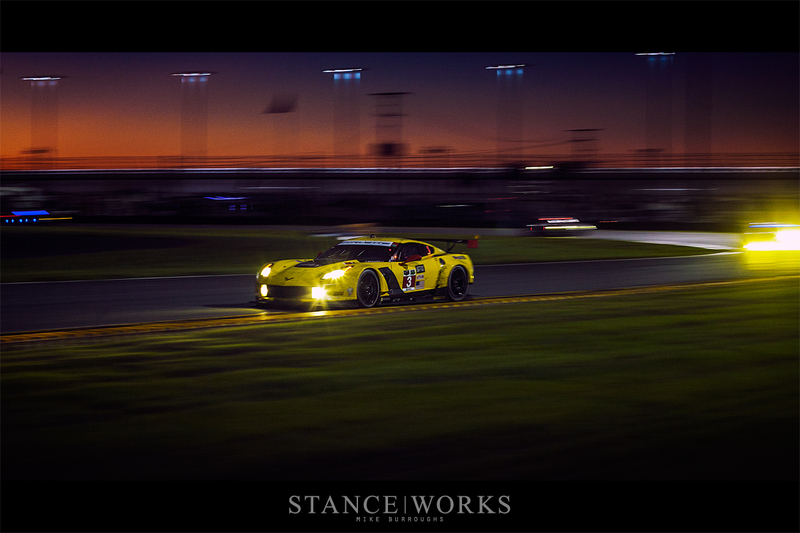 Yet, despite the Rolex 24's challenges, after 1440 minutes of continuous racing, only 0.4 seconds separated the GTLM series' victors. 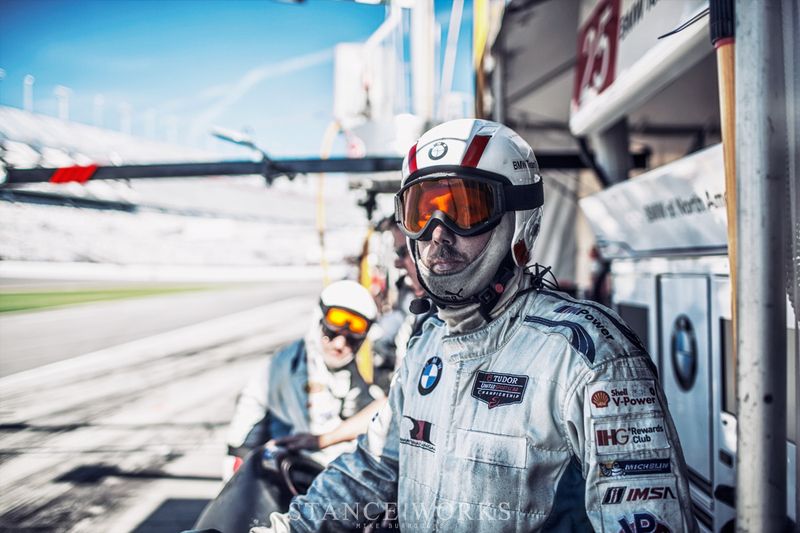 Having conquered the Rolex 24 in 2014, Andrew and I faced a new set of challenges this year. The Daytona International Speedway isn't known for its exciting course layout, even in roadcourse guise. All three banked turns are still in use, with a short jaunt through the infield and a chicane at the end of the oval's main straight offering the course's only shift away from the monotony of NASCAR. 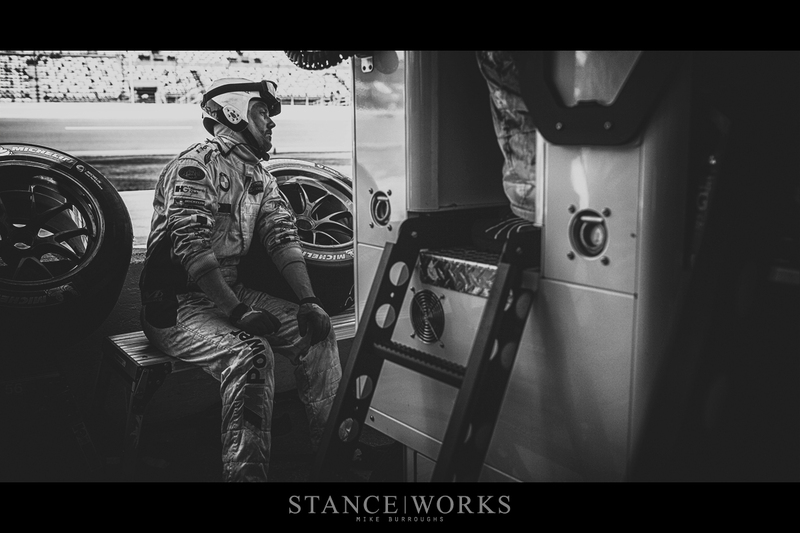 With 12 total turns, a number that is stretched to the limit for the sake of glorification, and 24 hours to spend along side them, Andrew and I knew that separating this year's journey through the race from the last would force us to hunt for the artistic inspiration we usually find trackside. While the Daytona Speedway didn't lend much in the way of excitement, the occasion did. 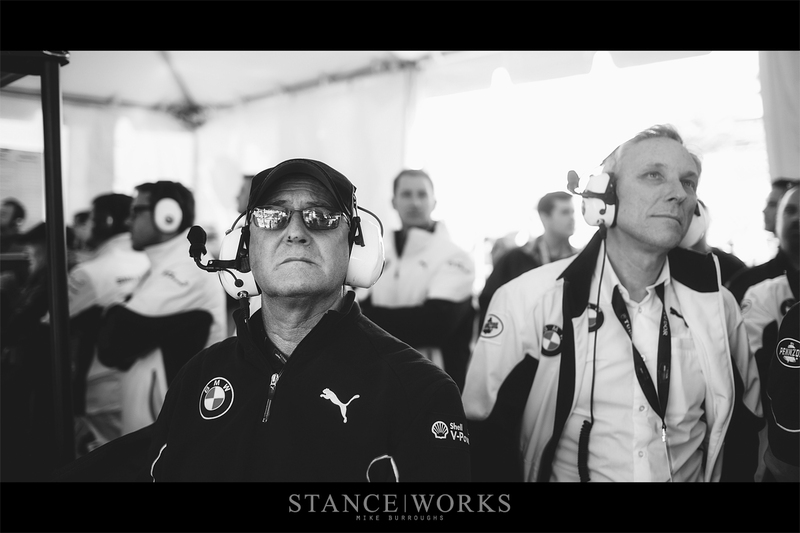 2015 marks the 40th anniversary of BMW Motorsport's first race in North America and the start of the 1975 season for the E9 CSL. New for this season is a fresh pair of Z4s, re-engineered for higher top-speeds. The new cars replace 2014's counterparts in hopes of squeezing out an overall victory before their retirement and subsequent replacement with M6s for 2016. The Z4s have received new numbers as well, dropping 55 and 56 in favor of 24 and 25, after the CSL - an ode to the anniversary at hand. 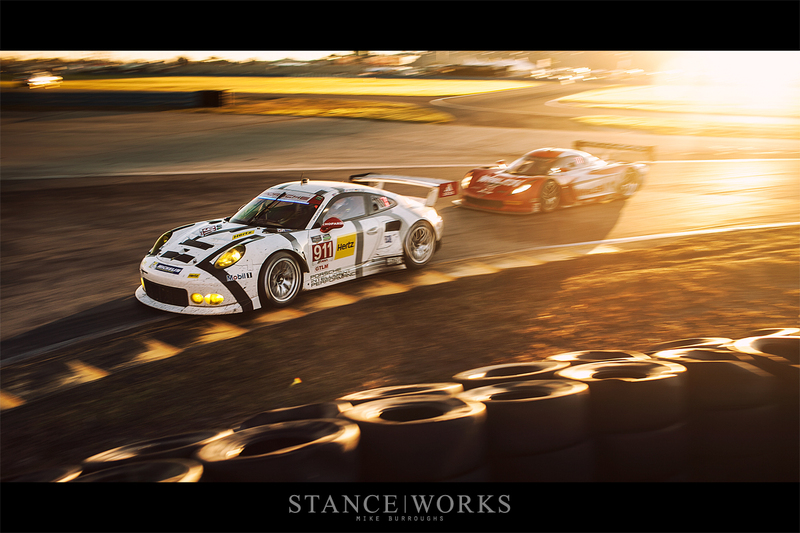 Corvette returned with their C7Rs, and Porsche too with their 991 RSRs. 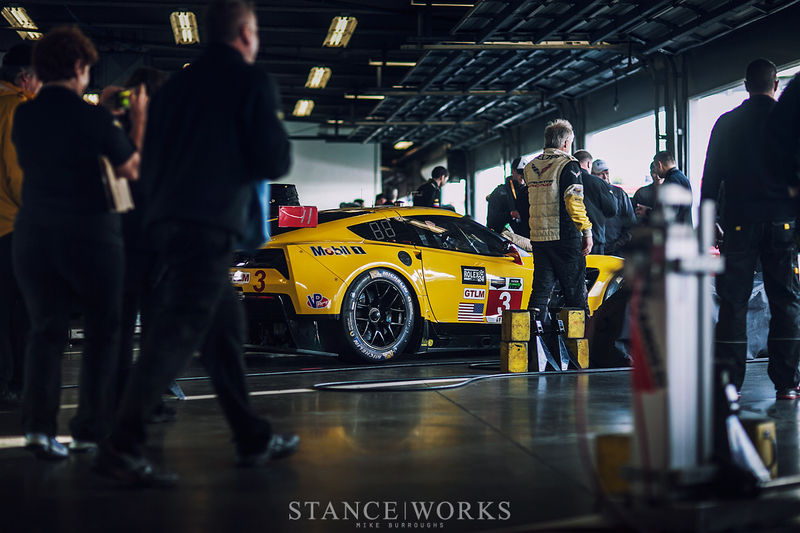 A few Ferrari 458s have stepped forth for the challenge, and new to the grid this year is the return of Aston Martin. When the Rolex clock tower began to tick towards 0:00:00 it was clear that the race was underway. For some, the beginning of the race brought about little to write home about. The weather was prime, track conditions were ideal, and few issues were caused on the tarmac. 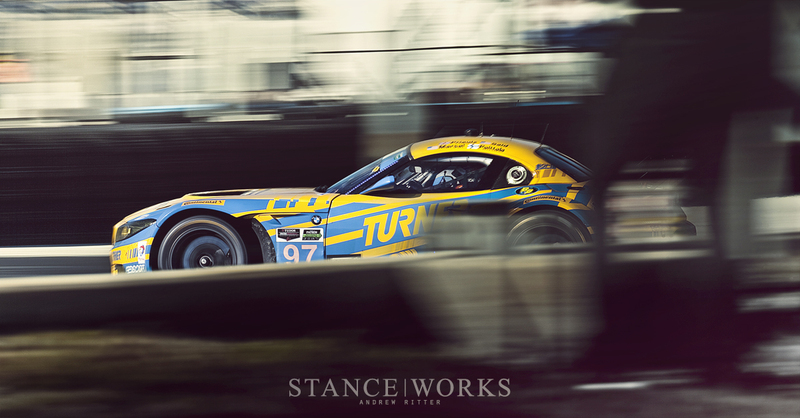 However, Turner Motorsport and their Renault-inspired Z4, things were far from perfect. 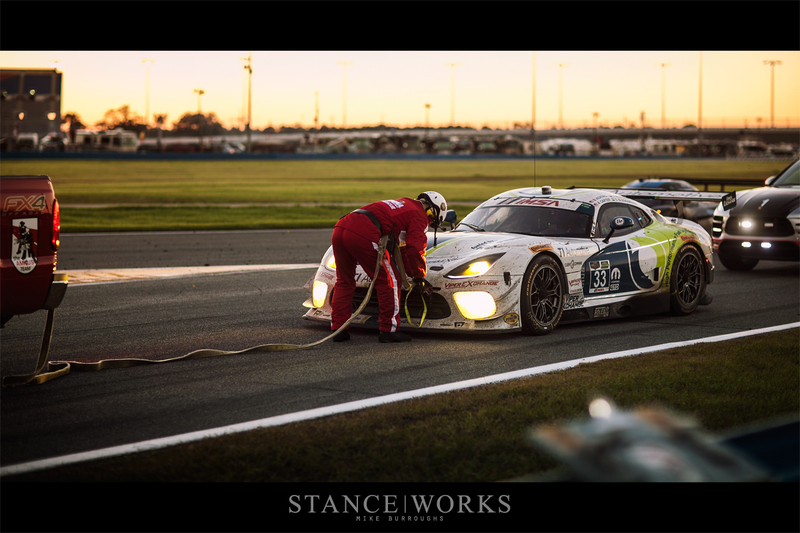 Their decision to return to the GTD class was met with transmission failure just two hours into the first race of the season. 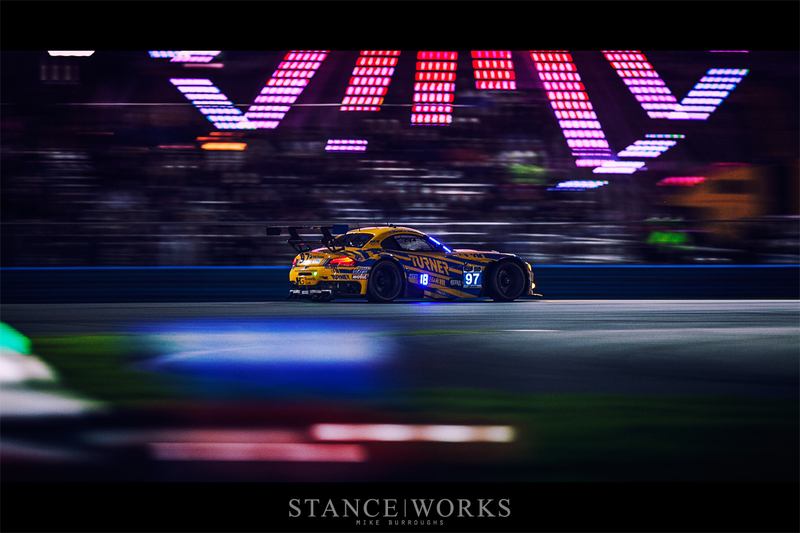 By the time the yellow and blue BMW made its way back on track, the team was a full 100 laps down, in dead-last place. Meanwhile, the early hours of the race went unimpeded for most. 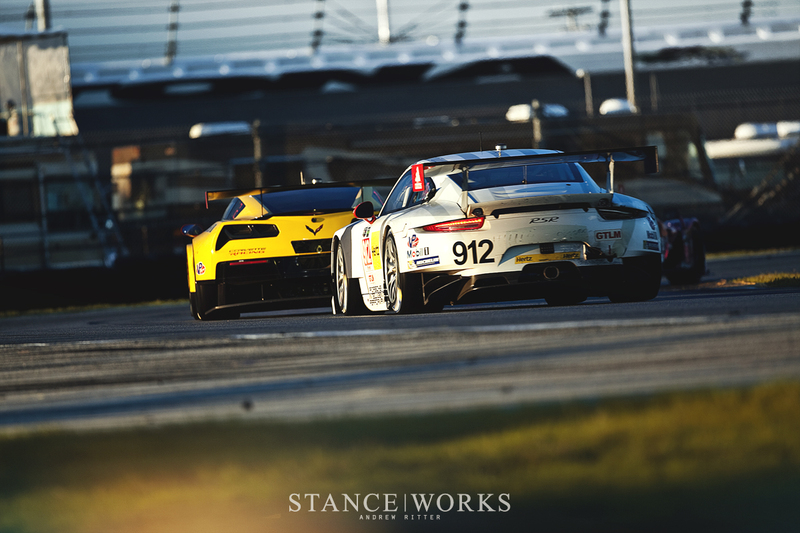 The GTLM field moved about, passing many prototype cars as the race progressed. It wasn't until nightfall that attrition began. 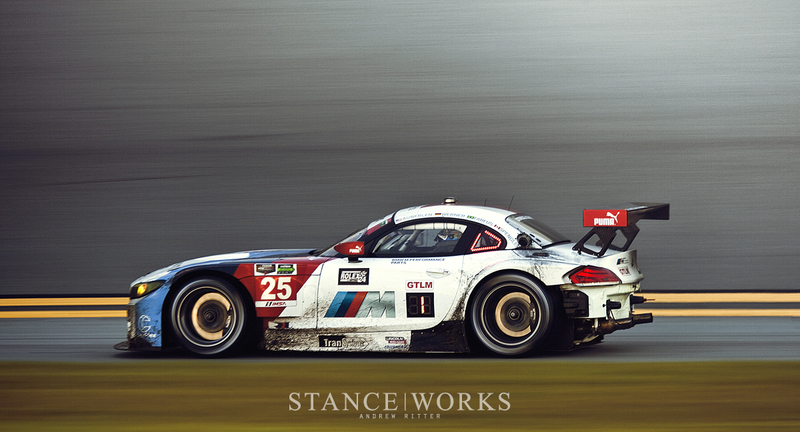 After being struck by another car, the number 24 Z4 was pulled off track for a steering rack replacement. 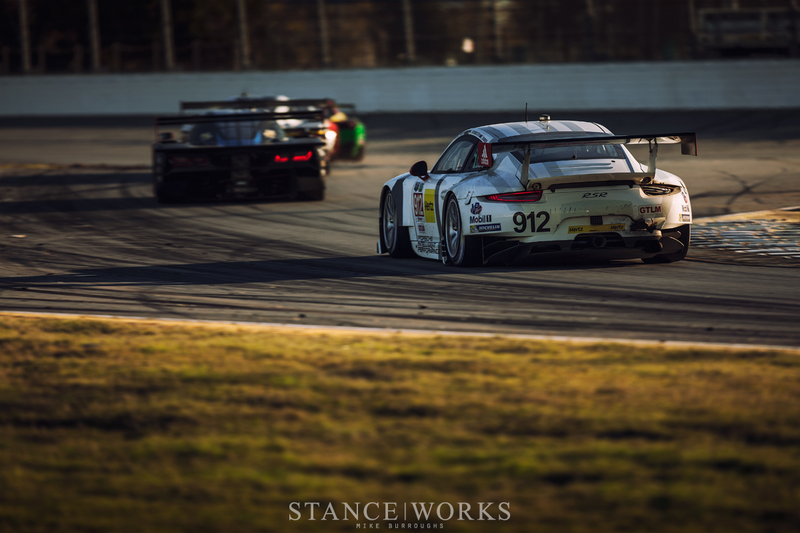 Another collision involved both factory Porsche cars, whom took each other out, narrowly avoided by other racers. We shot as nearly every car in the field began to encounter troubles in one form or another. Not all too long after the famed Daytona fireworks display, Andrew and I made the decision to get some rest. After fighting through the 24-hour race last year, we knew that sleep was on our side, and to do our best work, we'd need at least a little bit. Refueled after a few hours of rest, we returned to the track, where the drone and howl of racers set in their pace filled the stadium. More than 100,000 seats, now empty; campers and race fans tucked themselves away in tents and motor coaches, all in an effort to escape the bitter cold of night. The only souls that remained awake were those on duty. Andrew and I went to the pits, intent on catching the temperament and disposition of those trudging through the night. 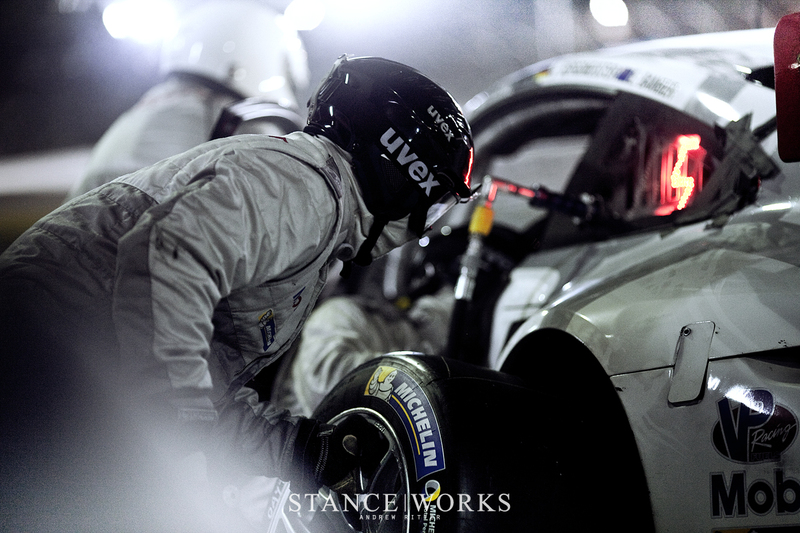 Periodic pit stops meant that the team's crew must be alert and ready; lethargy mustn't be allowed to set in. The crew was reduced to its bare minimum, allowing some to catch a glimpse of sleep as pneumatic impact guns screamed throughout pit lane. Night seemed to carry on, despite everyone's pleas for daybreak. It wasn't until hours later that the sky ignited and began to glow; first a deep, dark purple, and then further and further down the kelvin scale. Each minute that passed was a new photographic opportunity; the constant-changing light offered the first inkling of life back into the race's photographers, ourselves included. It wasn't long before the sky's glow was pierced by the morning sun, streaking long shadows across the track; delightful for photographers, but requiring drivers to undergo a full sensory reset, and to acclimate to new conditions. BMW had found their pace, with Bruno Spengler, winner of the 2012 DTM Driver's Championship, at the wheel of the number 25 car. 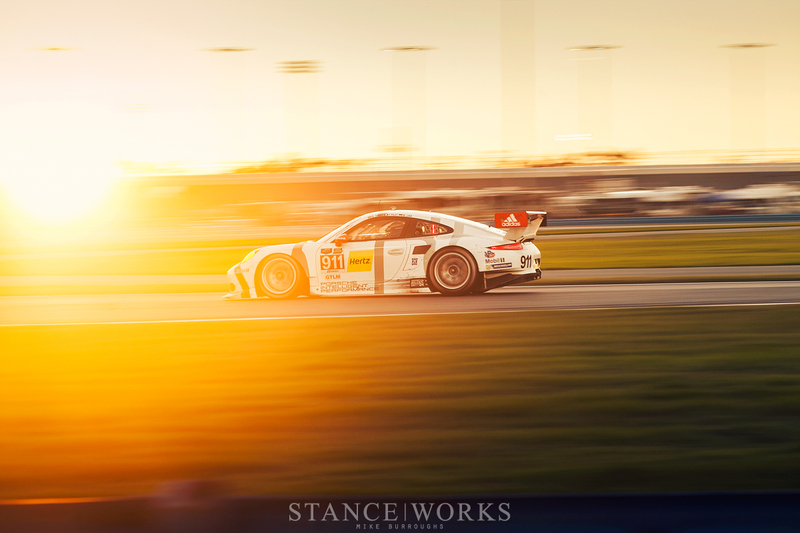 With the sun climbing higher, the Daytona air began to warm, and the track slowly but surely seemed to rise from the dead. 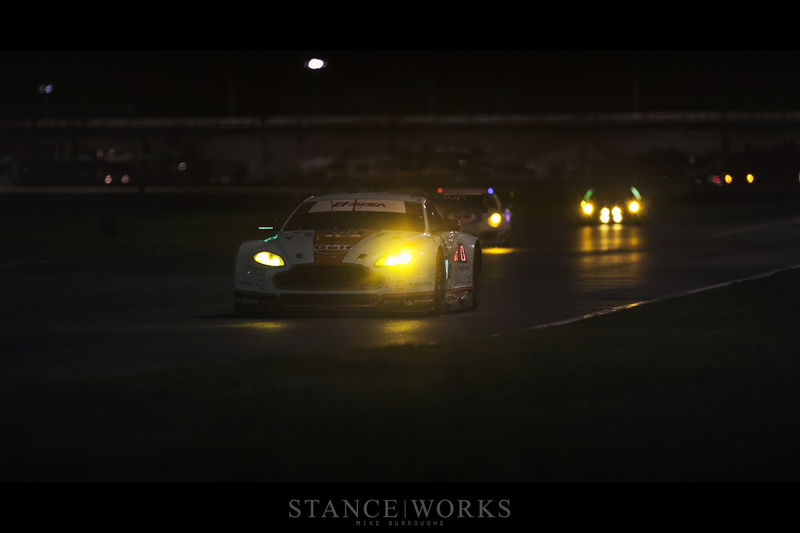 Even the racing livened up, with drivers finding new lines as their energy slowly returned; perhaps too much so. Just after 8:00 a.m, Spengler let his sprint-racer's side get the best of him, with a risky pass attempt ending in the dirt. Spengler was quick to recover, but lost his first-place lead, as well as a rear bumper, in the process. In initial talks with BMW, concern arose over the aerodynamic loss resulting from the missing rear bumper. It was initially assumed that, based off of the 2014 car's design, the lack of a rear bumper would slow the car down in the straights. 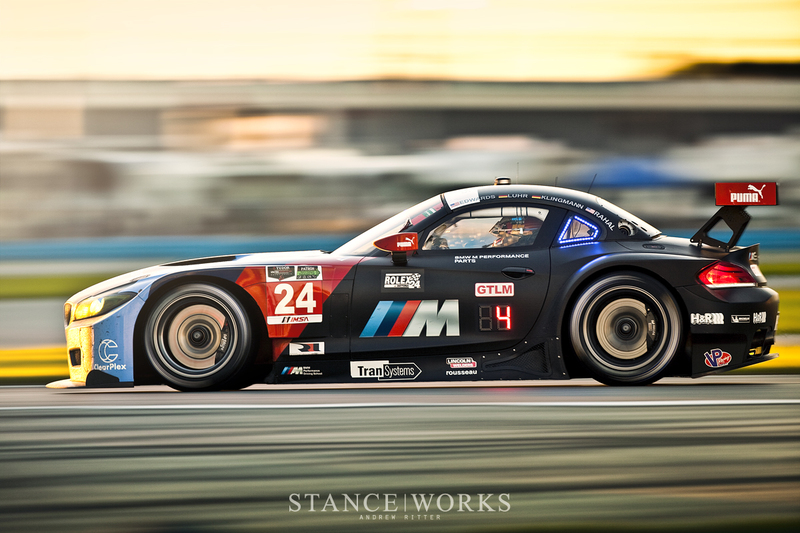 At Daytona, straight-line speed is a make-or-break factor, and while no one - not even BMW - expected the Z4 to win, the shrinking possibility of such caused a drop in morale. However, much to everyone's surprise, the Z4 actually increased in speed, with the techs at BMW suggesting "It's not the first time taking parts off of a car has made it faster." As the morning went on, stories carried throughout the pit. The story of the morning was that of Magnus Racing. Driver Andy Lally heard a thump against his car at 5:00am, but assumed nothing. It wasn't until the car was retired that the team found possum under the hood of his Porsche. Posthumously named Ballast, world's fastest possum was plastered across Twitter and other forms of social media. In one last hurrah for the critter, the team fought to return the car to the track to allow the animal to cross the finish line. 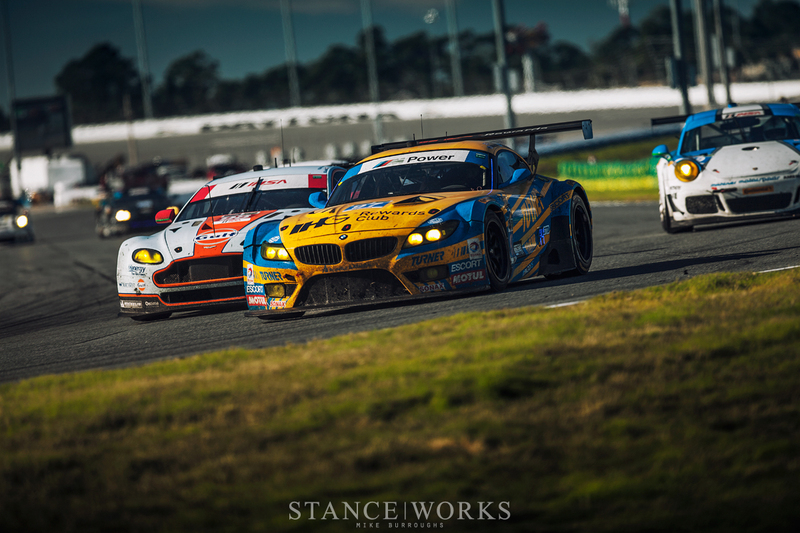 In news more related to the race at hand, Turner Motorsport's diligence had brought them back to life, and up to 12th in class. Porsche, on the other hand, had retired both cars by late morning, with the Falken 991 remaining as the only competitive P-car. Over time, BMW reeled in the Corvette that had climbed its way in to first place, eventually taking first place for themselves once again. 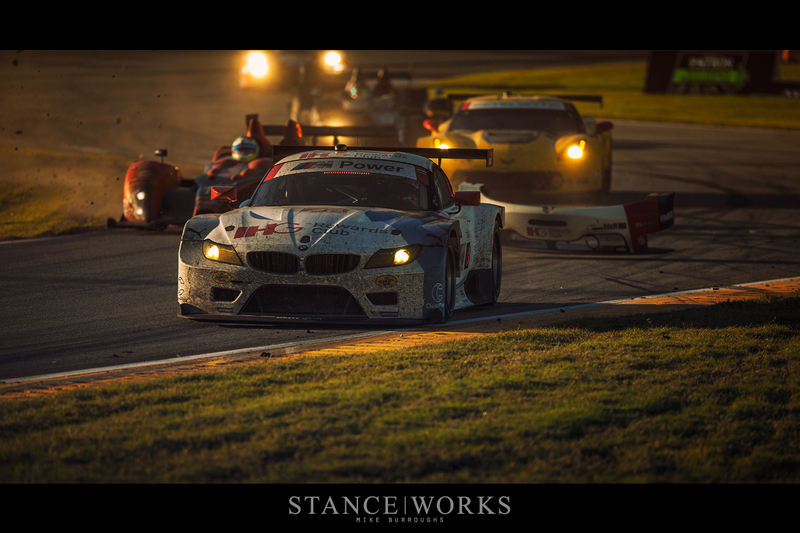 The two teams fought back and forth, timing pit stops strategically, with the nod going to BMW, until disaster struck. During a tire change, the passenger-rear wheel clung to the car, killing precious seconds as the crew tried to free it. On the driver's side, a mis-aligned wheel killed time even further, spinning off-center until the crew was able to right the situation. What should have taken mere seconds took more than a minute, moving the gap between Corvette and BMW to unexpected lengths. It wasn't until a yellow flag just 10 minutes from the race's end that BMW stood as a contender for the top spot once again. 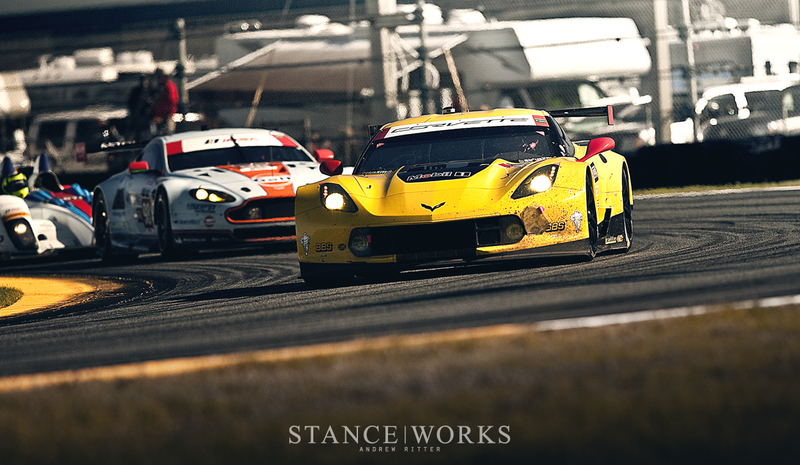 With the gap closed between the Corvette and the Z4, the final minutes turned the race's remainder into an all-out sprint. The team was glued to the monitors, anxiously watching as the final few laps counted down. 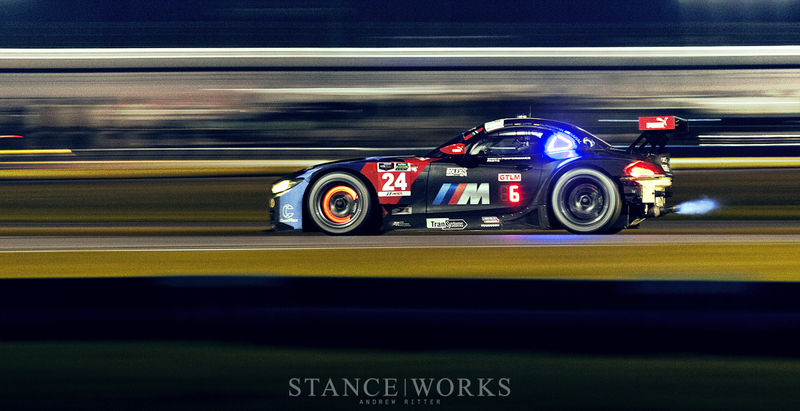 The Z4 and Corvette stayed close, but in the end, it simply wasn't enough to catch the American coupe, resulting in a 2nd and 4th place finish for the pair of BMWs, identical to their standings in 2014. Having withstood the punishment and trials of the Rolex 24 at Daytona, the Z4s are in good standing for the season to come. Guys, I love your normal featured photoshoots, but I just want to say how much I respect your autosports work. Its truly classic – you should compile an American LeMans (sorry…Rolex, Tudor, whatever it is) book with high resolution glossy photos and some short text. It’d happily find a home on my coffee table. Hands down best photos from all the sites I visit during lunchtime! 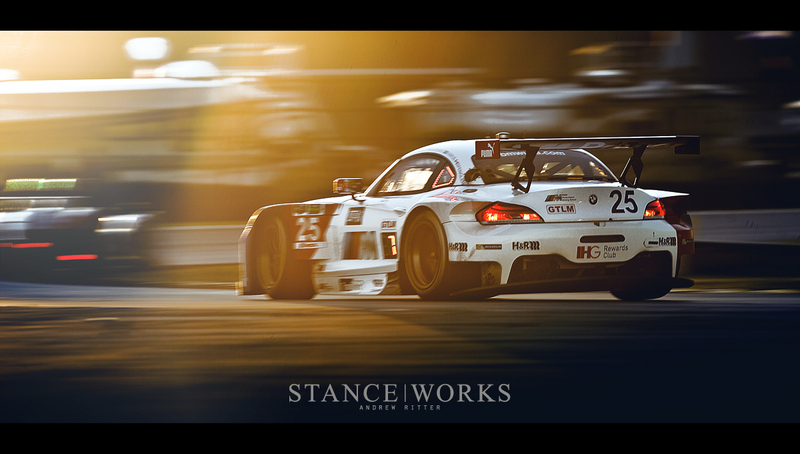 @matt A Stanceworks book…genius! I’m in. Do an American LeMans and also a book of the top features done. Can’t stop staring at these. I don’t think I’ve ever come across such beautiful motorsport photos. Fantastic work guys these are awesome!! You guys KILLED it! Thanks for the plethora of eye candy! the photo of the driver asleep on the chair is epic. Whatever camera was used to take these shots… and if they are edited. DAMN YOUUU GUYSSS!!!!!!! TOOO MUCH POORNNNN!!!!! It was a great event. Thank you for capturing the moments with such artistry. jesus mike those are some great pics what camera do you use ? 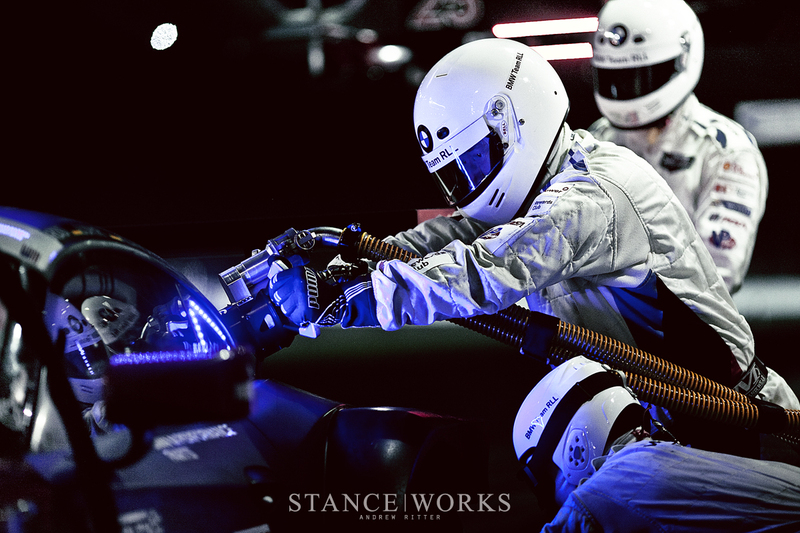 Staceworks—-You can not continue to ignore the many requests for a deluxe photo book!!! A photo book featuring all the the various marques would be equable, but I have an extreme bias for BMW. A deluxe visual feature, BMW only, with a slipcover and a selection of prints. 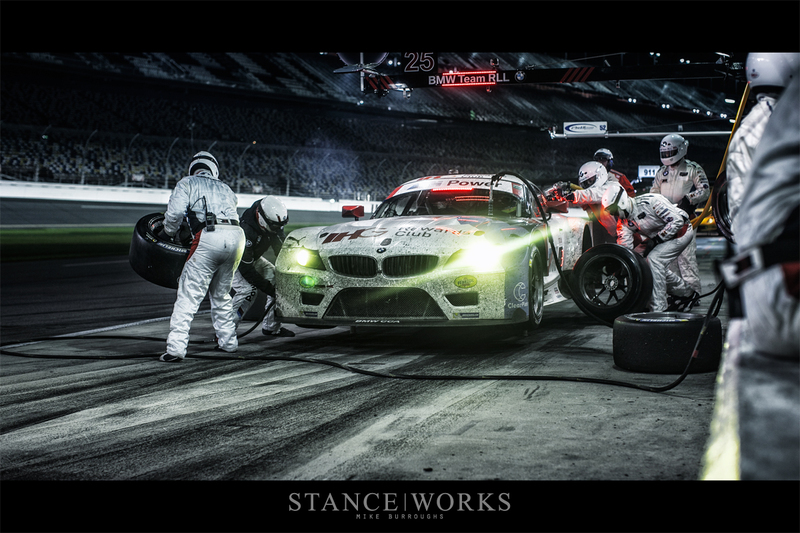 Make the break out Stanceworks.